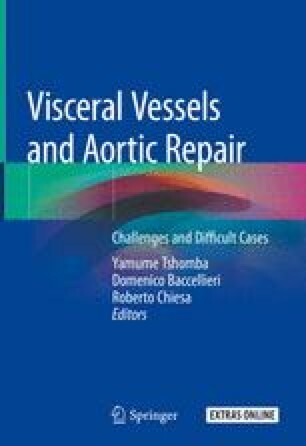 Renal dysfunction is a common complication after open thoracoabdominal aortic aneurysm (TAAA) repair that is often associated with poor outcomes (Tang et al., BMC Nephrol 18:184, 2017). In recent years, open TAAA repair morbidity and mortality have significantly decreased, mostly due to multimodal approaches based on distal aortic perfusion, together with several organ protection strategies (Wong et al., J Am Coll Surg 212:569–79, 2011). Among the surgical adjuncts that have been developed to protect renal function, the direct perfusion of renal arteries plays a crucial role. Current consensus practice guidelines recommend either cold crystalloid or blood to be considered for renal perfusion during open TAAA repair (class IIb, level of evidence B) (Hiratzka et al., Circulation 121:e266–369, 2010). This confirms the value of reducing temperature in order to prolong kidney ischemic tolerance but leaves open the choice for the substrate to be used (Semb et al., Acta Chir Scand Suppl 253:196–202, 1960). An organ protective solution should be effective due to its composition in addition to cooling. Until recent times, neither specific substrates nor infusion protocols were universally standardized. The result is that different solutions are now used across the world; however, lactated Ringer’s solution is the most common and is variably modified and customized according to individual practice more than to rigorous trials or evidence-based data. Different agents could be carefully evaluated and compared to establish the best solutions available for kidney protection; among these, the off-label use of Custodiol solution for direct in vivo renal perfusion has been shown to be safe and effective, even with reduced acute kidney injury rates compared to lactated Ringer’s solution. This chapter reports the state of the art of renal perfusion during aortic surgery and especially focuses on the rationale and results of the off-label use of Custodiol solution.